Although asparagus is available year round, they are best had in the early Spring. The Spring asparagus is sweeter and thinner, the latter being important because my favorite way to eat asparagus is roasted to a crisp. Being a rather impatient person, I prefer the thinner ones because thicker ones take longer to cook. Also, its really just the tips that get crispy, so its easier to get more of that flavor when I can consume a bunch of thin ones as opposed to a only a few of the thicker ones. Anyway, seeing the asparagus in the grocery store this year was an especially welcoming sign given that Boston had its most epic winter yet in terms of snowfall. As much as I love winter, I think I speak for nearly all Bostonians when I say, we were ready for Spring. 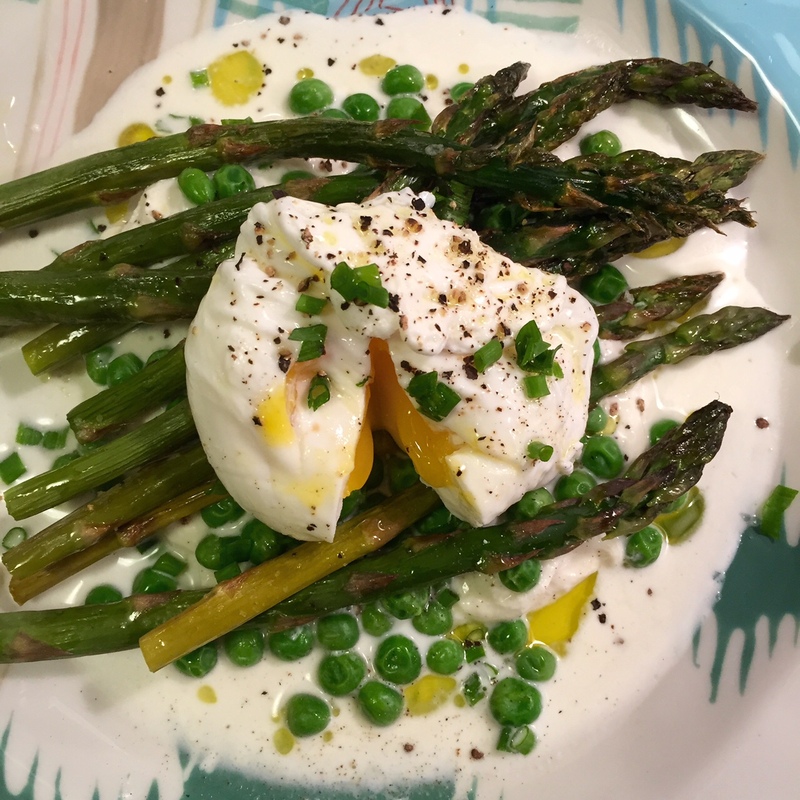 So with Spring in mind, I created this simple recipe that includes asparagus and another seasonal vegetable, peas, on a bed of burrata and topped it with a poached egg to make it a filling meal. Preheat the oven to 400 degrees F and place a saucepan filled with water on medium high heat to begin bringing it to a boil. Wash and trim the asparagus. The easiest way to do this is take a spear, have one end in each hand, bend it until it snaps, line the tip up with the rest of the bunch and cut the rest to the same length. If you have time, you can snap each one individually, too. Place the asparagus on a metal tray, drizzle with olive oil and sprinkle with salt and pepper. Place the tray into the middle rack of the oven and roast until cooked through and the tips are crisp, about 15 minutes. Meanwhile, pour the peas into a fine mesh sieve and place it into the saucepan. Using a fine mesh sieve will make it so you can re-use the water to poach the eggs. After 5 minutes, remove the peas, set them aside and turn the heat down to low so that its just barely simmering. Add vinegar to the saucepan and stir. The vinegar helps the egg to stay together and solidify in the water. Crack an egg and gently slide it into the water, on one side of the pan, while the water is still circulating from being stirred. Working quickly, crack another egg into the opposite side. If you cracked the first one into the center or missed your window of opportunity, wait a minute until the first egg begins to take shape, with a slotted spoon move it out of the way and gently stir where the next egg will go. The movement helps bring the egg whites into a round shape. Keep an eye on the saucepan because you do not want it to be boiling. Between 5-7 minutes, lift the eggs out of the water with a slotted spoon to see if the whites have solidified. If they are ready, then remove and place on a paper towel to drain. At this point the asparagus should be ready and plating can begin. 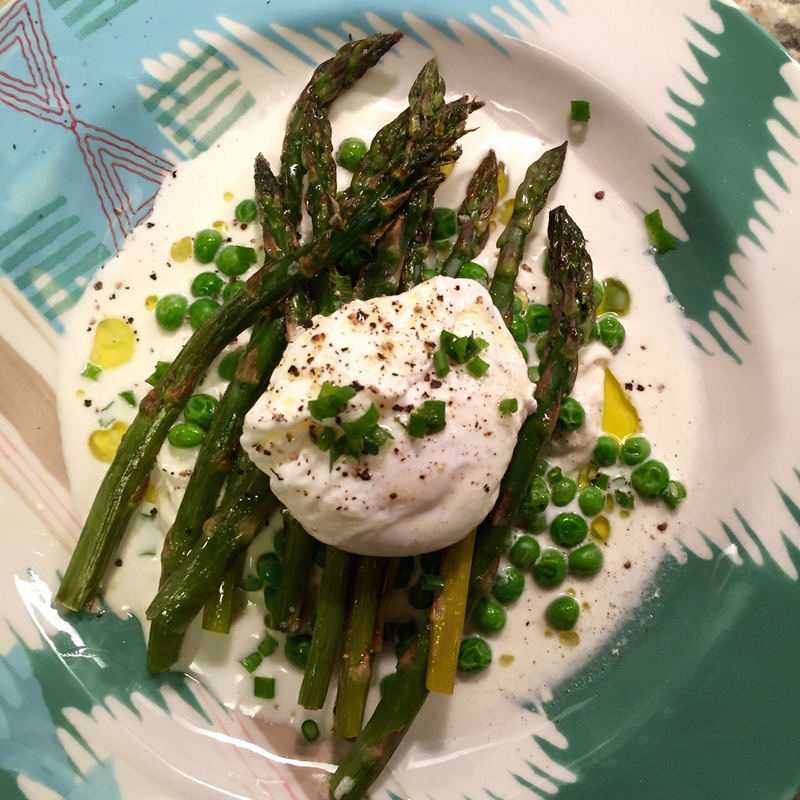 In a large plate, break up the burrata, lay the asparagus over it and add the peas. Season with salt and pepper and add a drizzle of olive oil. Gently place the poached eggs on top and enjoy!